Angled-Fan on Top Radiator | Perfex International Pte Ltd - Radiators, Charged Air Coolers, Heat Exchangers and Oil Coolers for power generation and other industries. This category of Radiators is suitable for a location that requires minimal disruptions, in terms of noise, air flow and space. The core surface is maximized by the angled configuration, allowing the height of the radiator to be compressed or lowered, as compared to vertical radiators. 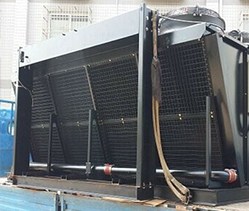 As this system utilizes the horizontal suction of air through the cores to cool it, and discharge of hot air vertically, it prevents recirculation of the vertical hot air into the cooling system. Noise is also reduced by channeling the peak noise in an upward direction.